OPSEU President Warren (Smokey) Thomas (far right) with striking ONA CCAC professionals in Kingston last Friday. About 3,000 professional staff at nine of the 14 Ontario Community Care Access Centres started walking a picket line Friday. Represented by the Ontario Nurses’ Association, it’s the latest labour disruption in a sector the government considers to be critical to its overall health strategy. About 140 OPSEU home care workers at ParaMed Home Health Care in Renfrew withheld their services last September after their agency initially failed to negotiate a deal that would lift many of its workers out of poverty. 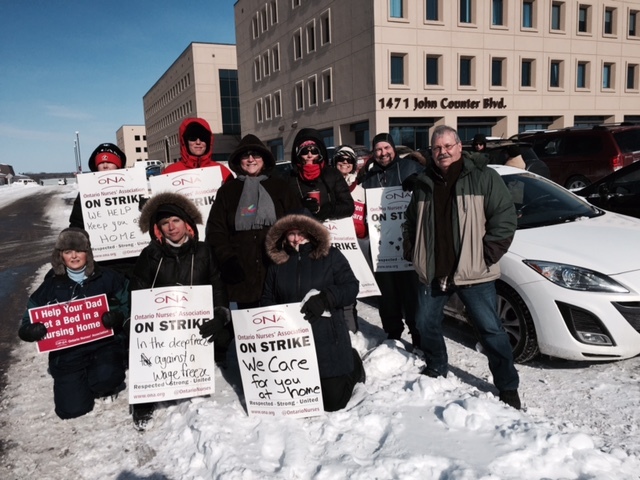 In 2013 SEIU took 4,500 personal support workers at Red Cross Care Partners out on strike over similar conditions. Following that strike the government implemented a well-intentioned but poorly constructed initiative to stabilize the Personal Support Worker (PSW) workforce by increasing funding for their wages over three years. As the government passed on wage increases for these PSWs, some private for-profit home care agencies clawed back compensation for travel time and mileage. 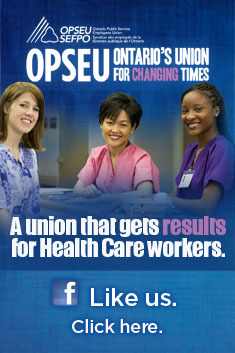 In Niagara and Norfolk Counties OPSEU’s nursing staff at CarePartners are likely to strike soon to gain a first contract. Health Minister Dr. Eric Hoskins has appointed former RNAO President Gail Donner to lead an expert review on the sector. Her recommendations are expected early this year. They can’t come soon enough. The pressures during this latest strike will be tremendous given Ontario’s underfunded hospitals have little room to maneuver now that the ability to discharge home care patients to the CCAC has become much more limited. The CCAC boards are looking particularly ridiculous. The Toronto Star reports that ONA was asking for a 1.4 per cent hike for its workers after emerging from a two-year wage freeze. To most people, that seems more than reasonable in the face of the lavish wage increases the CCAC boards have been bestowing on their CEOs. Dr. Eric Hoskins may be signing his name, but the latest Toronto Star letter-to-the-editor from the Health Minister sounds as tired and exasperated as those served up by his predecessor. Given Ministers seldom pen their own letters, we conclude it must be hard to get good help these days. Hoskins (or his ghost writer) insists that Star columnist Bob Hepburn is wrong – that in fact no cuts are taking place in home care. Never mind Erie St. Clair CCAC’s new executive director sent out a memo announcing a 33 per cent cut in daily nursing visits or that Care Coordinators at the Champlain CCAC are beside themselves having to recommend out-of-pocket paid alternatives to long-term patients who suddenly find themselves without a caregiver. Both CCACs are staring down millions in debt and are in freefall. But hey, aren’t we glad that no cuts are taking place? It’s the same old song and dance coming out of the Minister’s office. Hoskins insists that Windsor got $3 million more in funding this year and that overall $270 million has been added for home care. Demand is far outstripping this funding due to a planned multi-year freeze to the base budget of Ontario’s public hospitals. Care Coordinators are telling us that not only is this placing the CCACs under great pressure, but it is changing the very nature of the work they are doing. It’s all about post-hospital care, not about longer-term chronic care management and support. In this new video Anna Jover and Emily Visser highlight the voices of several OPSEU activists during Friday’s health care rally at Queen’s Park, including President Warren (Smokey) Thomas. 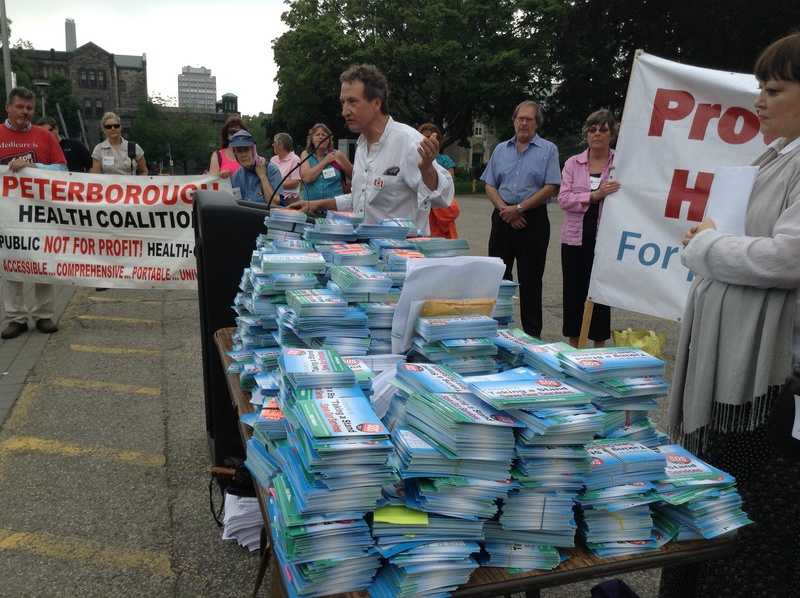 About 5,000 Ontarians came from all corners of the province to protest the increasing privatization of hospital-based services. Earlier this year the province began holding competitions for services provided by existing public hospitals, including diagnostics and cataract surgeries. 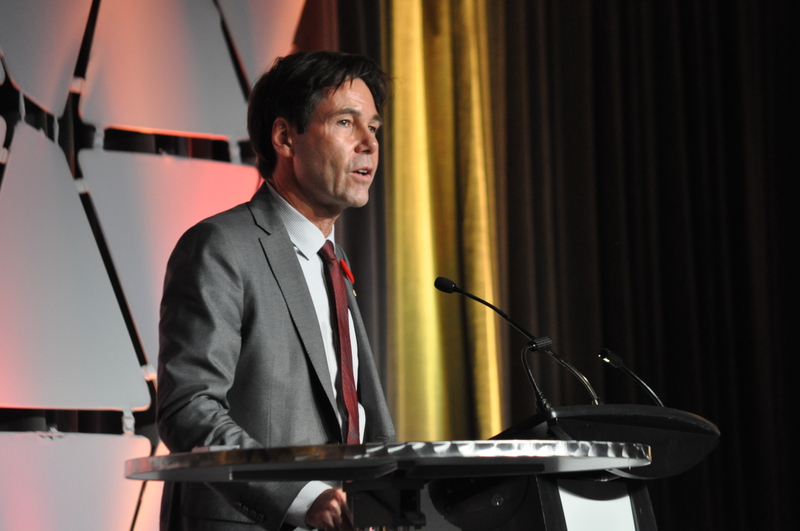 Those competitions were suspended by incoming Health Minister Dr. Eric Hoskins, but there has been no word from the Ministry whether this is a pause or whether the competitions would begin again at a later date. Further, the government has kept secret their commissioned Deloitte study that purportedly recommends the transfer of specialized medical laboratory testing to the private sector. When the Local Health Integration Networks were established labour complained that such destructive competitions that left shortages of caregivers in home care would be extended to public hospitals. At the time the government suggested this was no more than scaremongering. The Champlain CCAC continues to lurch from crisis to crisis. Is it time for the province to intervene — again? “It’s a question of how we can do work more efficiently and maybe less people.” – Patrice Connolly, vice-president of people and stakeholder engagement, Champlain CCAC. The Ottawa Sun is reporting the Champlain CCAC has cut services to a patient who has multiple sclerosis and cannot bathe, dress, or cook. Without his visits he cannot also do the exercises needed to keep him from stiffening up. Over the summer Champlain realized that it was headed for a $6.8 million operating deficit and reset the threshold for personal support services to an assessment score (RAI) of 15.5 – this on a scale that goes to 28.